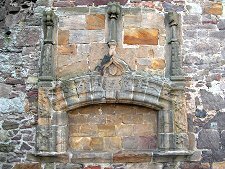 The village of Dirleton lies two miles west of North Berwick. Set within it and contained by an estate wall is a magnificent garden which the Guinness Book of Records certifies as being home to the world's longest herbaceous border. There is more to the garden than meets the eye. Viewed from the village you can see it contains an attractive domed dovecote. And from some angles you can also catch glimpses of a more substantial structure hiding amongst the trees. 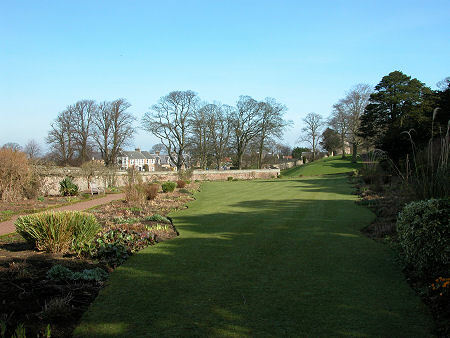 But it takes active exploration to uncover the real secret of Dirleton's gardens. As you make your way through the trees you suddenly find yourself confronted by a remarkable edifice. Dirleton Castle comes into view, perched proudly on a rocky outcrop and as improbable as it is impressive. Your first feeling is that this has to be a fanciful ornament placed here by the designer of the garden as an attractive and ruinous folly. It isn't: what you stumble across is one of the very best castles in Scotland. If you like gardens, all the better. But even if you don't, this is still an absolutely must-visit castle: fascinating and beautiful, and far more complex than it at first appears. The castle as you see it today was built in three main phases in different eras by three different families. It started with a castle comprising several circular towers and a complete curtain wall which was built on the natural rocky outcrop here by John de Vaux in the late 1200s. This original castle stuck closely to the outcrop, but with more extensive surrounding ditches than you see today. 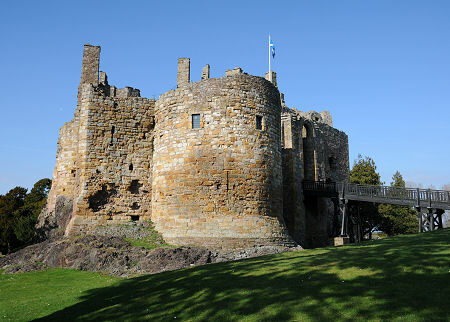 Ownership of Dirleton Castle passed back and forth between the Scots and the English during the wars of independence of the 1200s and 1300s, and it was finally slighted by Robert the Bruce after the Battle of Bannockburn in 1314 to prevent its future use by the English. The main surviving elements from this period lie at the south end of the castle, with the most impressive being the huge drum tower or donjon. This originally stood a storey higher than it does today, and the main floor formed the lord's hall, with a kitchen below. The remains of the castle passed from the de Vaux family to the Halyburton family by marriage in the mid 1300s. 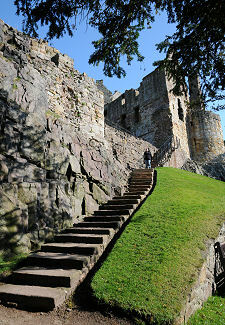 They spent a good part of the following hundred years rebuilding and redeveloping Dirleton Castle. Large parts of the castle can be traced back to this period, including the extremely strong gatehouse, which would have provided the main entrance to the castle. The modern access bridge occupies the site of the original drawbridge. The Halyburton range occupies the whole of the east side of the castle. At first floor level, now open to the elements, they built a great hall with a withdrawing room beyond it. In a square tower above the withdrawing room was the family accommodation. Today the most impressive part of the range is the huge vault below it. At the north end of the range the lower level was home to a chapel and a priest's room. Below the chapel was the dank and gloomy prison: though this must have seemed pretty idyllic to the unfortunates who inhabited the 11ft square pit below the prison, where the truly unpopular prisoners were dumped. In 1515 the estate passed, again by marriage, to the Ruthven family. Between efforts to gain power by kidnapping the young King James VI (see our Historical Timeline), they turned their medieval castle into a semblance of a grand renaissance house. Their main surviving contribution to today's castle was the range of buildings to the south of the close intended to provide much more comfortable accommodation than was possible elsewhere in the castle: and in a position that overlooked the extensive gardens they developed to the west. Dirleton Castle's end came with the arrival of Oliver Cromwell. It was used as a base by moss-troopers attacking his supply routes during his invasion of Scotland. Retribution, in the form of General Monck, arrived in 1651 and the castle was badly damaged by his cannons during its capture. In 1663 the ruins of the castle were acquired by the Nisbet family, who built a modern mansion house at Archerfield, nearer the coast to the north west of the castle. During the 1700s and 1800s Dirleton Castle featured largely as a very grand garden ornament, and the gardens were redesigned by a new head gardener, David Thompson, in 1858. The castle and gardens passed into state care in 1923 and are now looked after by Historic Environment Scotland. The west garden was restored to David Thompson's plans in 1993, while the north garden became home to the herbaceous border referred to in the opening paragraph.